The GPM calculator has now been updated with all MPG levels from 10 to 30 MPG (and all even MPG values from 30 to 50 MPG). This tool is ideal for letting you see your gas and cost savings from a "Cash for Clunkers" trade in. How to use it: Select a driving distance and gas price of your choice. Compare your current MPG level (15 MPG) to a wide range of more efficient MPG levels (e.g., 24 MPG, 27 MPG, 33 MPG) to see your gas and cost savings. 1) These tables directly caclulate the gas and cost savings of trading in a car that gets 18 MPG or less for different combinations of cars with higher MPG. 2) The following table shows why MPG is misleading as a measure of gas savings and why we need to look at "GPM" measures such as "Gallons per 100 Miles". "Gallons per 100 miles" makes clear that the improvement from 14 MPG to 25 MPG saves more gas (3 gallons per 100 miles) than any possible improvement on a 33 MPG car. Here is a downloadable version of the table below. If you want to know your carbon impact, saving 100 gallons of gas reduces carbon dioxide emissions by roughly 1 ton. He provides data showing that the CO2 emissions from manufacturing a new vehicle are close to 7 tons on average, which is a higher figure than I was assuming in earlier posts. That makes the CO2 "pay back" period longer when replacing an old car with a new one. Although my favorite example of replacing a 14 MPG car with a 25 MPG car holds up fine (the carbon emissions are offset in less than 25,000 miles of driving), the case for smaller improvements becomes much harder. The New York Times reviews the two bills currently circulating: The Israel/Schumer/Feinstein bill ensures a sizeable increase in GPM (roughly from the mid teens to the high 20s) that quickly "pays" for itself in CO2 reduction; the Sutton and Stabenow bills do not. The key insight: Ideally, Cash for Clunkers rebates would be tied to the magnitudue of GPM improvement. The goal would be to reimburse a 14 to 25 MPG replacement more highly than a 24 to 27 MPG replacement (the first change reduces CO2 by 3 tons over 10,000 miles, the second by just half a ton). If reimbursements are not tied directly to GPM improvements, then the focus should be on rewarding trading in cars in the teens for cars in the high 20s (as emphasized in the Israel/Schumer/Feinstein bill). The final June 18 Cash for Clunkers bill is described here. 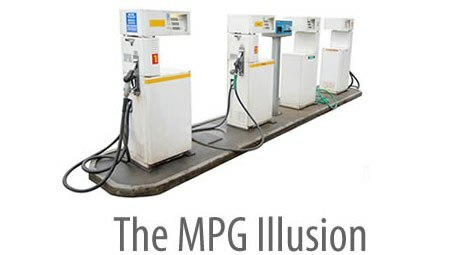 Follow this link to an online GPM calculator and a downloadable table of gas savings based on the MPG levels in the new bill. See the blog archive on the right to find recent posts on Cash for Clunkers. The specific information that was posted below is now outdated and we have deleted it. Please consult the new post.